Dies R Us: A Little Head Start! 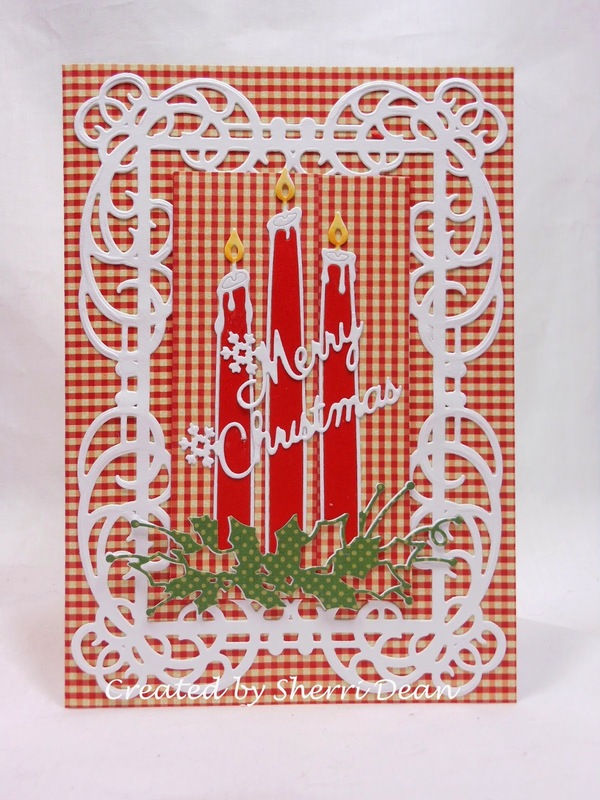 Cheery Lynn Merry Christmas Sentiments, Memory Box Shining Candles & Spellbinders Mystical Embrace. I wanted a country feel to this card, but you could just as easily do it in beautiful, glossy or embossed papers. The great thing about dies is you get to decide the final look! I hope this has given you the urge to make a few Christmas cards of your own! Check out the store as you will find endless choices at the best prices anywhere! Don't forget to check out the Challenge Blog too! We would LOVE to have you enter & play along! Cool new stuff! I love those candles in the wonderful Spellbinder frame! I have the Merry Christmas dies and I have never used them....my bad! I love how you have put this together on the gingham paper. Just wonderful!